2012-2013 school year: books relate to real life situations! 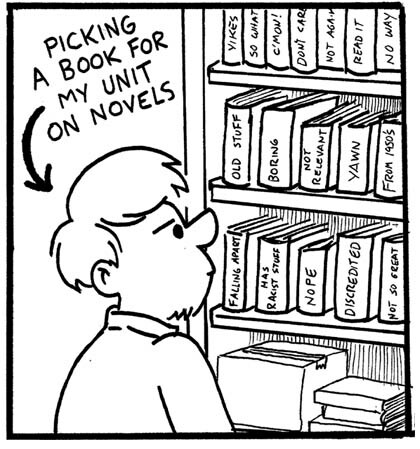 Another comic about the hellhole that is our department’s book room was drawn here back in 2009. Still taking this week off from producing new work, but I thought I’d mention to everyone: I’ve been posting OLD comics on my Tumblr blog for the past few days. I’m talking… like 10 years old in most cases. Looking at how bad I used to me will give you a newfound appreciation for how good I am now, right? RIGHT? Seriously though, I’m not trying to run myself down. The comics I’m posting over there are fun but they have next to nothing to do with teaching. Since this is ostensibly a blog about teacher comics during the school year, I didn’t want to muddy the waters. You should check out what I’m posting over there though. I posted a Harry Potter comic today. …including but not limited to the end of the first quarter marking period, grading 9th graders’ sustained silent reading projects, an impromptu trip to Western New York, the oncoming Halloween holiday… and other events have lead me to decide that taking a week off from posting teaching comics would be a good idea. Let’s all meet back here next Monday for some new stuff, OK? Thanks! During the first quarter of school, I give the kids a very general sustained silent reading project. 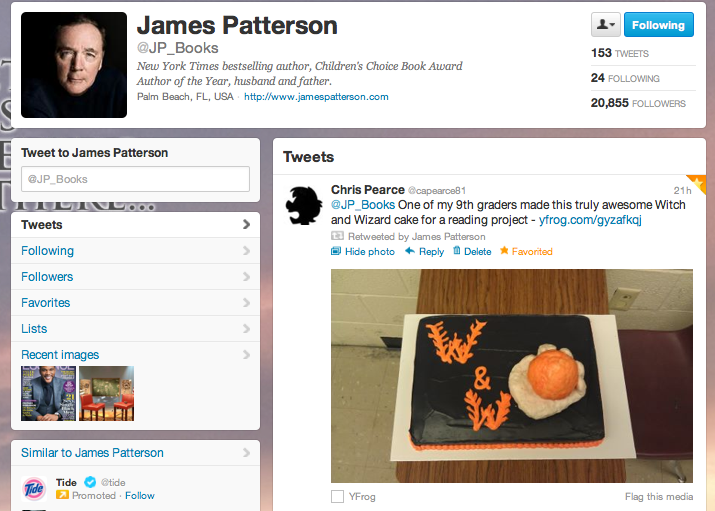 Students are asked to pick a book for leisure reading that they’ve never read before… a book they know they will enjoy. They are then asked, over the course of a few weeks’ time, to produce “a work of art” relating to their book. I purposely make the guidelines general because I want to give students the freedom to interpret the word “art” to their own understanding. In the years I’ve been doing this SSR project, I’ve received delicately shaded pencil drawings. I’ve graded GIGANTIC paintings. I’ve examined elaborate sculptures and dioramas. 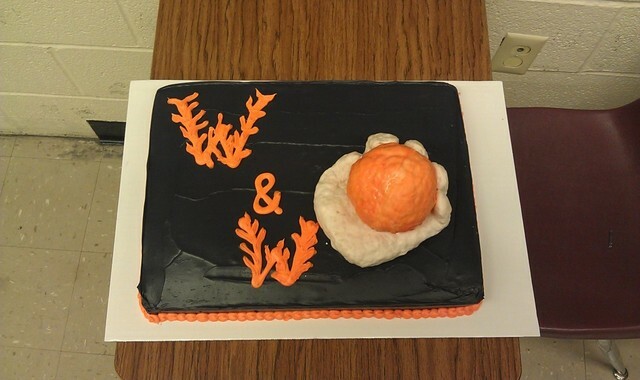 I thought I’d seen everything… but I’ve never had someone turn in a cake for a grade before this week. 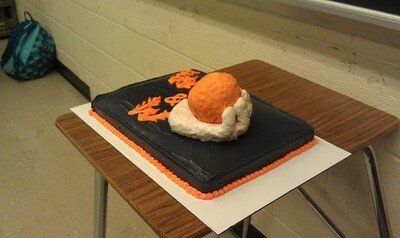 One of my students read Witch and Wizard by James Patterson and decided to make this cake as his art. The cake is chocolate with purple frosting and orange highlights and the hand with the magical fireball is done in Rice Krispie Treats and covered with fondant. I’ve done a couple of comics on Homecoming before, but it’s a whole different ballgame comparing Freshman to Seniors. Freshman don’t really seem to care all that much. It’s a bit of fun to them. It’s serious business to 12th graders. You are currently browsing the Teachable Moments blog archives for October, 2012.